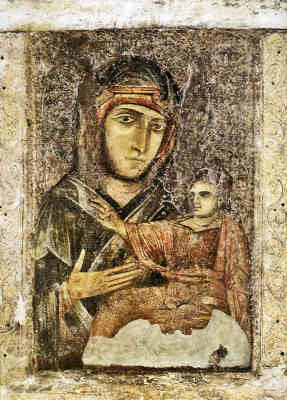 The story was that a Greek holy man named Theocles Kmnia, praying before this icon in the Church of St. Sophia in Constantinople, saw an inscription on it: "This work made by St. Luke, Chancellor of Christ, must be taken to the Church of St. Luke on Guardia Mountain and installed on its altar." Without knowing the mountain's location, he pleaded with the clergy of St. Sophia until they agreed to let him take the image there. For some time he traveled without finding anyone who know of such a place. Finally, in Rome, he met the Bolognese ambassador, who knew that two sisters, Azzolina and Beatrice Guezi, had retired to a life of prayer on Lookout Mountain, Monte della Guardia, outside Bologna, and had built a chapel on the hill dedicated to St. Luke. Supplied by the ambassador with a horse, a servant, and letters of recommendation to the leaders of Bologna, Theocles carried the icon there. On May 8, 1160, the Bishop of Bologna led it in procession to the sisters' hermitage on Monte della Guardia. At this point, the story moves from legend to documented history. In 1192, another holy woman, Angelica di Caicle, retired to the mountain with the intention of building a bigger church there. On May 15, 1194, the bishop of Bologna laid the first stone. In 1249, Dominican sisters settled there. The image was carried in procession to Bologna on April 4, 1302, during Charles de Valois' invasion, and again on July 5, 1433, after months of damaging rain. The rain's end is commemorated in an annual procession from the sanctuary to Bologna, which since 1476 has taken place on the Saturday before the Feast of Christ's Ascension (always a Thursday). The holy icon remains in Bologna for a week, returning to the sanctuary on Ascension Sunday. It was ceremonially crowned April 5, 1653 by the archbishop and in 1857 by Pope Pius IX. The Blessed Virgin of St. Luke is the patron saint of Bologna. Information and image from the Sanctuary's site, www.sanlucabo.org.